The standard milk Chocolate Casino Chips come in 9 different denominations and are made with 100% Belgian Chocolate. 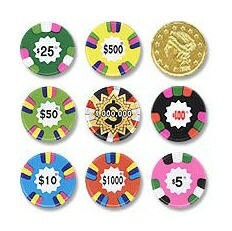 They are perfect for your Casino Party or Las Vegas Wedding! Starting at just $0.18 per chip. They come in boxes of 345 chocolate casino chips. Price per box is below.